Simultaneous in-film polymer synthesis and self-assembly for hierarchical nanopatterns. Qiang Z, Akolawala SA, Wang M. ACS Macro Letters. 2018:7:566-571. The shape of protein-polymer conjugates in dilute solution. Lam CN, Chang D, Wang M, Chen WR, Olsen BD. Journal of Polymer Science Part A: Polymer Chemistry. 2015:54:292-302. Crossover between activated reptation and arm retraction mechanisms in entangled rod-coil block copolymers. Wang M, Likhtman AE, Olsen BD. 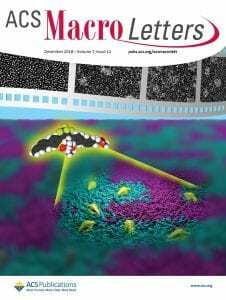 Journal of Chemical Physics. 2015:143:184904. Self-diffusion and constraint release in isotropic entangled rod-coil block copolymers. Wang M, Timachova K, Olsen BD. Macromolecules. 2015:48:3121-3129. Anomalous self-diffusion and sticky rouse dynamics in associative protein hydrogels. Tang S, Wang M, Olsen BD. Journal of the American Chemical Society. 2015:137:3946-3957. Tube curvature slows motion of rod-coil block copolymers through activated reptation. Wang M, Likhtman AE, Olsen BD. ACS Macro Letters. 2015:4:242-246. Crossover experiments applied to network formation reactions: Improved strategies for counting elastically inactive molecular defects in PEG gels and hyperbranched polymers. Zhou H, Schön EM, Wang M, Glassman MJ, Liu J, Diaz DD, Olsen BD, Johnson JA. Journal of the American Chemical Society. 2014:136:9464-9470. Diffusion mechanisms of entangled rod-coil diblock copolymers. Wang M, Timachova K, Olsen BD. Macromolecules. 2013:46:5694-5701. Experimental measurement of coil-rod-coil block copolymer tracer diffusion through entangled coil homopolymers. Wang M, Timachova K, Olsen BD. Macromolecules. 2013:46:1651-1658. Counting primary loops in polymer gels. Zhou H, Woo J, Cok AM, Wang M, Olsen BD, Johnson JA. Proceedings of the National Academy of Sciences of the USA. 2012:109:19119-19124. Diffusion of entangled rod-coil block copolymers. Wang M, Alexander-Katz A, Olsen BD. ACS Macro Letters. 2012:1:676-680. Measuring shear strength of soft-tissue adhesives. Wang M, Kornfield JA. Journal of Biomedical Materials Research Part B: Applied Biomaterials. 2012:100B:618–623.